The NFT systems is quite similar to the Ebb & Flow except for a few things. First, it doesn’t need a timer because it runs 24/7, so you don’t need a timer to control cycles. 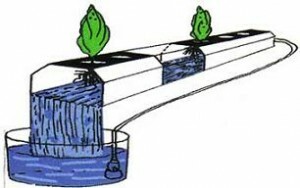 But like a Ebb & Flow system it also has a reservoir that’s below the level of the plants. This way gravity will be able to allow the nutrient solution to flow/drain directly back into the reservoir to pumped back up to the plants again. The main difference between the two is that a NFT system does not actually flood the system. It rely’s on a continues flowing stream (film) of nutrient solution at the bottom of the containers that hold the roots of the plants. The roots that reach down into the nutrient solution, are able to wick up moisture to the upper roots, and the upper roots can also still get the air/oxygen that the plants need as well. Although a NFT system could be made in many different ways, they are usually laid out as series of tubes in rows that hold the plants. The tubes allow the water to be directed easily from one end of the tube to the other end, that way all the roots get water (nutrient solution). An important aspect to an NFT system is that the containers (tubes) are tilted downward on one end. The water is pumped into one, then gravity allows it to flow downhill to the other end. From there it can be collected again in a return system (that can be constructed many different ways). From there it’s directed back to the reservoir to be pumped back up to the plants again. You can have just 1 row, or hundreds of rows in one system, and can be easily expandable. Drip systems are quite simple. They are similar to a drip irrigation system you would have for your flower beds in dirt. Except instead of just plain water, with a hydroponic drip systems the water is the nutrient solution (just like any other hydroponic system). There are actually two ways to run a drip systems, a recovery system, or non recovery system. A recovery system just means that you collect the nutrient solution after it drips, and return it back to the reservoir where it can be pumped out to the plants again. A non recovery (also called drip to waste) just means that you don’t recover/return the nutrient solution, and it’s just allowed to drip into the ground or somewhere else. Most drip systems are recovery systems (so the nutrient solution is reticulated). The nutrient solution is pumped through the lines out to the plants, then it drips down through the growing medium to the bottom of the container where it’s then directed back to the reservoir through return lines. With a drip system gravity is what allows it to flow back to the reservoir, unlike an Ebb & Flow system where it’s siphoned back to the reservoir through the pump and fill line. The aeroponic system is similar to the Ebb & Flow system also except the roots are completely suspended in the air. Naturally with the absence of a growing medium to hold in moisture, the roots will dry out much quicker. Because of that, the timer needs to be capable of many more cycles per day. The roots are directly sprayed by misters that spray the nutrient solution frequently. The nutrient solution drips down off the roots into a reservoir, or collection area to be collected and sprayed again. A true aeroponic system will have the roots completely suspended in air. Again, any type of hydroponic system can be constructed many different ways, with many different materials, but most aeroponic systems sold in stores are really a combination aeroponic/NFT, or aeroponic/water culture system. A true aeroponic system will completely suspend the roots in air. You may have herd of Aquaponics and wonder why It’s not listed as one of the different types of hydroponic systems. Well Aquaponics is not really a hydroponic system, it’ actually a technique used to create the nutrient solution. Using fish waste, as well as living organisms to decompose the fish waste so it’s broken down into a form the plants can absorb. Also so that all the elements for healthy plant growth are in sufficient quantity’s in the solution. Once the living environment has produced a quality nutrient solution, it can be used in any of the different types of hydroponic systems as the nutrient solution. Although the aquaponic technique can be used in any type of system, it’s probably most commonly used in conjunction with a water culture system, NFT or Ebb & Flow systems. Many hydroponic systems combine one or more aspects from the other types of systems. There is nothing wrong with that, but it is important to understand how each different type of system works and functions. Now that you know what makes each type of hydroponic system different, you can recognize what they are, and if they are actually a combination system or not. Also you will be able to build your own hydroponic systems, either by combining different aspects, or just a straight forward system.